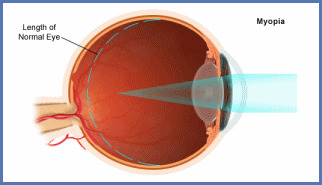 People often confuse farsightedness with another condition called presbyopia, which occurs as a normal result of aging. Presbyopia affects most of those over the age of 40 and all over the age of 51, as the aging process affects the eyes' natural ability to bring near objects into focus. Presbyopia occurs when the lens inside the eye loses flexibility, preventing accurate focusing on objects that are up close. People with this condition may experience eye fatigue when reading in poor lighting or at the end of the day, trouble changing the focus from distance to near, or the need to constantly reposition reading material in an attempt to find the right focus. This condition affects people with good vision or myopia (nearsightedness), but is more problematic for those who are hyperopic (farsighted). Prior to becoming presbyopic, hyperopes were able to naturally accommodate to bring things into focus at any distance. Suddenly, after 40 years of living without needing vision correction, hyperopes often lose both distance and near vision at the same time because their eyes can't compensate any longer. 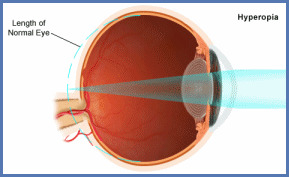 Presbyopia has been traditionally treated with reading glasses, bifocals, or contact lenses. But now there is NearVision CK (Conductive Keratoplasty), a minimally invasive procedure developed specifically for presbyopic patients who need near vision improvement. Click here for more information about the procedure.